Daisy Chain Book Reviews: Reviewed by Arianne: Salvage by Keren David. 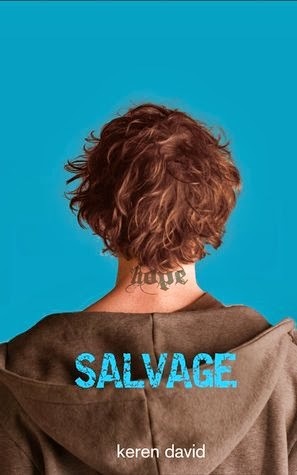 Reviewed by Arianne: Salvage by Keren David. Release date: January 16th 2014. Aidan Jones was my brother. But I couldn't really remember his face. I couldn't remember talking to him or playing with him. He was just a gap, an absence, a missing person. I glance at the paper. There's a big picture on the front page. A girl with dark red hair. A girl with eyes that might have been green or they might have been grey. I sit down and stare at Cass, and it is her, it is. My stolen sister. Aidan's a survivor. He's survived an abusive step-father and an uncaring mother. He's survived crowded foster homes and empty bedsits. His survived to find Cass. If only he can make her understand what it means to be part of his family. . . I wish I could say otherwise, but I’m just not very good at writing glowing reviews. I've given a trickle of starred ratings in the past, but Salvage is one of those rare books that convinced me to part with a fully-fledged constellation, and for that, I cannot thank the author enough. Keren David has written the kind of book you don’t ever want to forget. It's better than chocolate, and I just did not want to put it down. Aidan Jones hasn’t seen his sister since she was four years old. For all he knows, she could have completely wiped his existence from her memory - whisked away into a life of safety and privilege while he was left to fend for himself in a system that barely even gave him a chance. He doesn’t resent Cass; he just misses her. He’s moved on from foster care, got himself a girlfriend, a job and a place to live. He’s finally on the right track – okay, he drinks too much and his past keeps dragging him down, but he's a good guy, really. Isn't he? For Cass Montgomery, her derailment is only just beginning. She's smart but what's more she's hard-working, dreaming of Oxford and the degree in history that awaits her there - but ever since her politician father shacked up with his intern and shattered family life as she knew it into a million pieces, she’s been stumbling around in the dark. Defensive and unforgiving, she tries to hold it together for her mother and younger brother Ben, but she knows she won’t be able to keep it up for long. Then her other brother Aidan – the one she thought long lost to her – contacts her out of the blue, and suddenly, there’s a whole new world open to her. It’s risky, it’s nothing like she’s ever seen before; a world of single mothers and secret meetings with siblings in London parks, but what if it’s exactly what she needs? What if the collapse of her own family means she can finally discover another one? Salvage is a fantastically well-written book. The description is unobtrusive but searing; it plays out like a movie, somehow grainy, gritty and glossy at the same time. Told in alternating double chapters, the narrative voices of Aidan and Cass are so different they set the other all asunder; but it works. It feels important that we’re hearing from both characters, who even at the moment their paths cross are living very different lives. The dialogue is eye-catching and entertaining, hurtling along in a flurry of biting remarks and flashes of humour. One thing Aidan and Cass have in common is the influence of outside forces on the direction their lives have taken. These people have shaped the route our heroes have travelled, presenting a whole host of complications and challenges and leaving them with little personal say in the matter. They're flawed kids, scratched, dented and broken by their upbringing. They earn the reader’s alliance immediately. Their stories are littered with scenes of utter desolation, bitter fury, deep hurt and above all, fierce hope. The complex breakdown of Cass’s adopted family is met with stellar handling. Her parents’ split has been splashed across the headlines and the impact it has on everyone involved is monumental. I loved that Cass was angry and bitter. All too often young adult heroines embroiled in family drama are encouraged to simply feel confused, bewildered and in need of constant reassurance, but Cass? She takes control of her emotions and makes her own decisions, whether they end up being good decisions of not. That’s the beauty of this book – Keren David allows her characters to make mistakes. They’re human; human enough to find courage, and human enough to have to deal with consequences. I was surprised at how much I loved Aidan's interaction with his long-term girlfriend Holly - because on the surface this is a book about long-lost siblings, but it is in fact an exploration of family in all its forms. There are characters here who are connected by blood and experiences, love and hate. From Aidan’s sense of duty, responsibility and affection for Holly’s son Finn - who’s become just as much a part of his life as Holly has - to the harsh realities of life without the guidance of parents or good role models, the depth and care with which Keren approaches her themes is astonishing. It's clear that Aidan in particular has a lot of personal issues he needs to resolve, but you never stop rooting for him as he struggles to find a way through. In short: Reading Salvage was an experience I lack comparison for. It’s an extraordinary novel about messy, complicated kinds of love. It’s about admitting your brokenness and finding your own path. It’s about family, forgiveness and forging on, for yourself, for the people who matter and even for the people who don’t. It’s completely full of heart; utterly absorbing and engaging. Cass and Aidan are fighters, and warmth shines out from every page. It's not bound by the traditional drawbacks of any one category - it's a story like none I’ve ever read before, and one I’ll never forget. Wow, this sounds like an amazing list. Awesome review! Thanks for stopping by and taking the time to comment. I really appreciate it! Please note: This blog is now an award free zone. Thanks to everyone who has awarded the blog in the past. DISCOUNT CODE: DAISYCHAINBOOKREVIEWS20 FOR 20% OFF! DISCOUNT CODE: DAISYCHAINBOOKREVIEWS20 FOR 20% OFF! Twilight Reimagined: Worth Reading or Just Another Moneyspinner? Book Review: Rage Within by Jeyn Roberts. Book Review: You Let Me In by Lucy Clarke. Neptune's Tears Blog Tour: Interview with author Susan Waggoner. Please read if you subscribe to (and want to keep reading) this blog! Discussion: Has Book Blogging Fallen out of Fashion? Book Review: Girl, Missing by Sophie McKenzie. Podcasts: Five to try if you love True Crime. Life update: Hello from London! Daisy Chain Book Reviews is licensed under a Creative Commons Attribution-Noncommercial-No Derivative Works 3.0 Unported License. Based on a work at daisychainbookreviews.blogspot.com.